Andrea Gabrieli was one of the main figures in Venetian music life in the second half of the 16th century. In our time he is more or less overshadowed by his nephew Giovanni whose compositions, especially his sacred works and his canzonas, are far better known than Andrea's. During the Festival Early Music Utrecht 2016, devoted to Venetian music, several ensembles performed motets from his pen which were virtually unknown. There is every reason to put him more into the spotlight, as the present disc suggests. The motets I referred to were mostly taken from his first publication which was printed in 1565 and shows the influence of Orlandus Lassus. There are reasons to believe that the latter wanted Gabrieli to join him at the Bavarian court, but for some reasons it didn't happen. It is possible that Gabrieli had set his mind on the post of organist at San Marco; he applied for it in 1557, but was not successful. It was not until 1566 that he became one of the basilica's organists, when it became clear that Annibale Padovano would not return to Venice after a period of leave. Although the composition of sacred vocal music was not his main duty, he published three collections of sacred pieces between 1672 and 1683, the last being his best-known, a set of settings of the penitential psalms. A number of his compositions were included in anthologies, and after his death some of his sacred and secular works were published by his nephew Giovanni, who also inclided some of his own compositions. The present disc sheds light on Andrea's activities in Venice outside the church. The work-list in New Grove includes a large number of madrigals which were published between 1566 and 1580. The disc reviewed here is devoted to the Madrigali e ricercari which were published posthumously in 1589. It is recorded here complete; it comprises 31 pieces - if the various parts of a madrigal are counted as separate items - for four voices. The book is divided into two sections: first 25 vocal pieces, then six ricercares. The latter are here disseminated across the programme. It is assumed that the collection is an anthology of pieces written over a period of 30 years. This could explain the diversity of forms: one sestina (a fixed verse form consisting of six stanzas of six lines each), five madrigals, two ode songs, a conclusion (congedo) of a canzona, two octosyllabic sestinas, a sonnet and an octave (a verse form consisting of eight hendecasyllables [lines of 11 syllables]). Only in some cases the authors of the lyrics are known; the collection opens with a madrigal in six parts, Giovane donna sott'un verde lauro, on a text by Petrarca. Several pieces refer to characters which indicates that they were composed for theatrical performances. Fuor, fuori a sì bel canto has the addition pastori, In quest'amate sponde is sung by ninfe. Canto, canto! and Febo, Febo noi cantiamo are cori of little boys (putti) and of Phoebe respectively. According to Giulia Anna Romana Veneziano, in her liner-notes, the three quatrains Asia felice or ben posso chaimarmi - E io più allor felice - Felice Europa were written for a Carnival masquerade in 1572. Unfortunately I could not find the scores of these pieces on the internet. I would have liked to see exactly how they were notated, especially concerning the role of instruments. The liner-notes are not entirely clear in this regard. It seems unlikely that they included independent instrumental parts, but in these performances the instruments not only play colla voce. There are passages where the instruments play without the voices and they also regularly depart from the vocal lines. They participate in every piece. I probably would have preferred some pieces to be performed by voices only, just for the sake of variety. Here and there the balance between voices and instruments is a little less than ideal. It is interesting that the instrumental ensemble includes a mandola, a kind of mandolin. It is known that this instrument was often used in the late 16th-century, but today it is not often included in performances of instrumental music from this period. 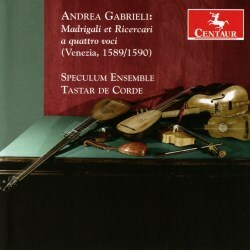 This is the first complete recording of the Madrigali et Ricercari a quattro voci of 1589/90. That makes this disc a significant addition of the discography. The quality of these pieces is a further argument that Andrea Gabrieli's music deserves more attention. It is hard to understand why his many madrigals are largely ignored by madrigal ensembles. Rather than performing and recording the same pieces over and over again they should pay attention to madrigals like those by Andrea Gabrieli. This disc is certainly a good start, also because of the fine performances by singers and instrumentalists. The fact that the upper voice is sung by a male soprano (called cantus) - although its range is well within the reach of a male alto - is probably in line with the practice of the time. On a sad note, Roberto Di Cecco passed away in February 2015. There are two issues regarding the production. First, there is too much space between madrigals which belong together. Second, the booklet omits translations of the lyrics. The listener is referred to a printed edition of Andrea Gabrieli's madrigals, but one can hardly expect him to purchase that just for the translations of these pieces. This is a serious blot on a production which every lover of Italian madrigals should investigate.